Google’s free operating system seems to have gained the likings of laptop manufacturers across the world. This seems to be true when Samsung launched its latest device named Chromebook 3 which has been launched along with their Notebook 9 Windows laptop. Chromebook 3 from Samsung comes with features similar to that of Lenovo 100S Chromebook. But in certain cases Chromebook3 from Samsung surpasses Lenovo 100S. 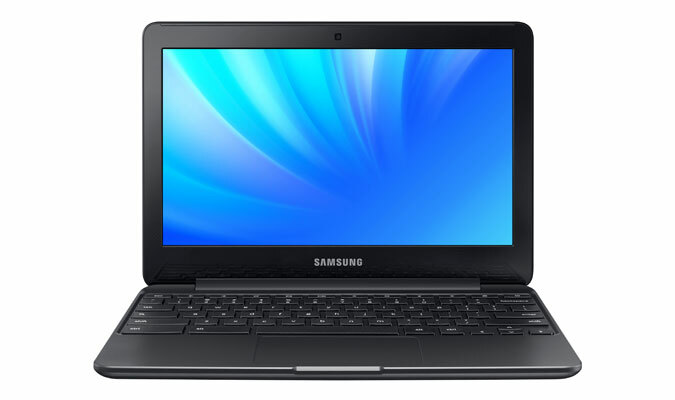 Samsung Chromebook is loaded with a dimension of 11.36*8.04*0.70 inches, which makes it small when compared to Lenovo. The device seems to be slim when compared to its competitors. But the device comes with a weight of 2.53 pounds, which is little heavier than Lenovo. Samsung Chromebook 3 is loaded with a display of 11.6 inches wide. This screen is having a resolution that measures to be 1366*768 pixels. Just the Lenovo Chromebook, Chromebook 3 from Samsung is also loaded with Intel Celeron class chipsets. But Samsung Chromebook features N3050 chipset while Lenovo features only N2840 chipset. Similar to that of Lenovo, Samsung Chromebook 3 also features storage of 16GB SSD with a RAM of 2GB. This RAM can be extended upto 4GB. No information is available regarding the increase of storage option in Samsung Chromebook. Samsung Chromebook 3 is loaded with one USB port of v3.0 and another USB port of v2.0. The device is also loaded with one HDMI port and one headphone or microphone jack. Samsung also features one microSD card slot, but when it comes to Lenovo 100S Chromebook, this comes to be a full sized SD card slot. The officials of Samsung promised that their latest device can lasts upto 11 hours of battery when the device is fully charged. But they haven’t revealed anything related to the actual capacity of their device’s battery. Its rival, Lenovo 100S Chromebook has a battery that supports nearly 11 hours 19 minutes when tested. They also didn’t reveal much detail related to pricing. While their earlier version had a price of $249 and Lenovo 100S has a price of $179. Acer C720 loaded with similar features is tagged with a price of $199. So Samsung Chromebook is expected to have price reasonable within these limits. The officials also made it clear that the latest device go out for sale by the first quarter of 2016.